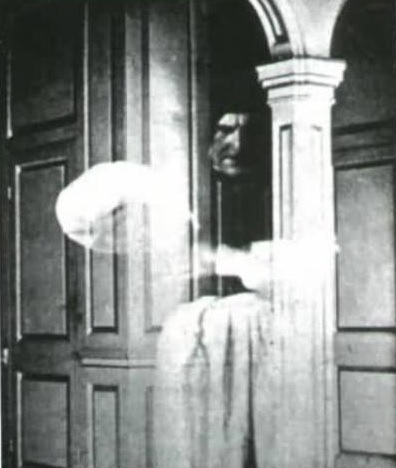 This picture was taken in 1908 by a Mr. A. S. Palmer in a notorious house in Somerset, England, and currently appears with no backstory on multiple websites that feature 'ghost photos'. For the full story on the photo, follow the 'Related Articles' link. The copy of the photo above comes from the Ghosts and Ghouls website [Link Here]. The following copy of the image is scanned from Elliott O'Donnell's ca.1948 book Haunted Britain, which is the first actual presentation of the photo in print.